This month I am very excited to be a guest blogger for the Colour Collaborative. Especially as the theme is 'collections'! As long as I can remember I have loved collecting things. Especially bits picked up when out and about. Growing up on the Isle of Wight, we were lucky to be surrounded by wonderful countryside and sandy beaches. As a family, we would spend countless hours beach combing or walking our dog through the forest and woods. I remember we all had our own little 'thing' we liked to collect at the seaside. My mum would pick up little yellow shells and my nan pieces of pale yellow and pink rounded quartz. My sister and I were always on the lookout for sea glass, especially rare cobalt blue pieces. 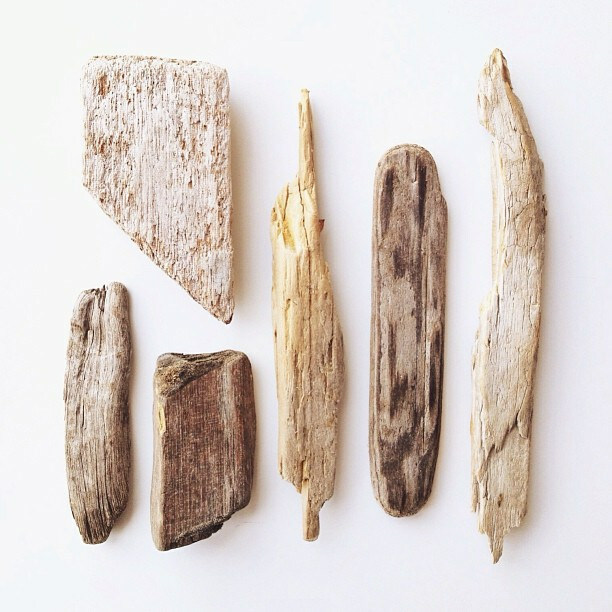 I have a memory of my Grandad holding out his closed hands for me to choose one of the treasures he'd found on the beach. I picked the hand with a pretty pink Cameo that must have fallen out of someone's jewellery. The other hand, and my sisters treasure, was a big piece of blue sea glass. My love of collecting is something I have passed on to the kids and they can spend ages picking up treasures that catch their eye. 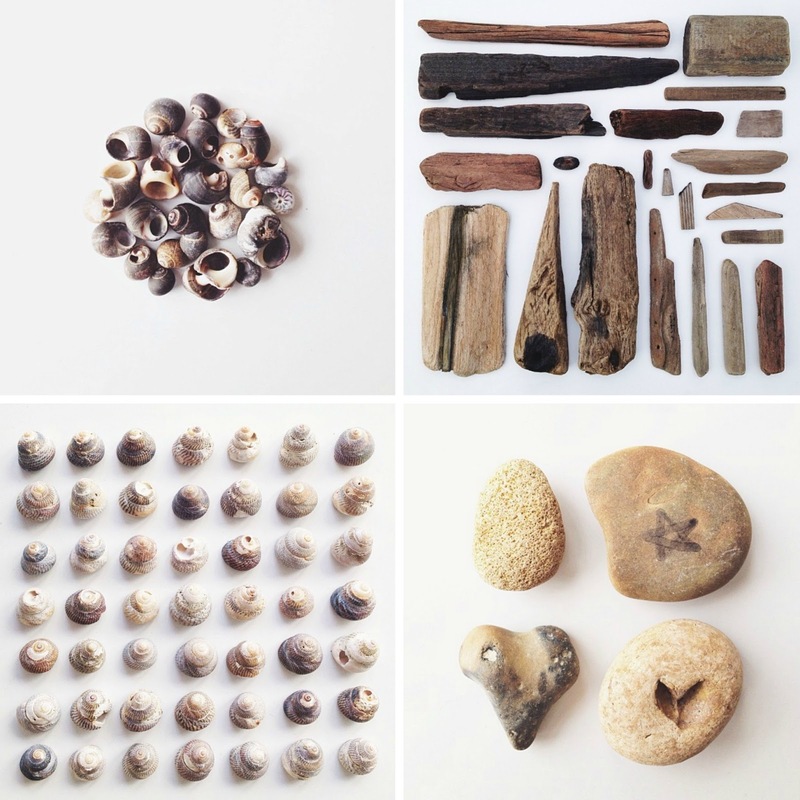 Filling up their little bags or pockets with unusual stones, shells and driftwood, and often brightly coloured pieces of plastic too, their colours worn and softened by the sea, but still vivid enough to stand aloud from the abundance of pebbles. My favourite thing to collect is sea glass. I could spend hours looking for those ocean tumbled shapes in hues of white, seafoam, green and brown and the occasional piece of blue - oh how I still get excited when I find a piece of blue! They're like little frosted jewels, standing out amongst the calm and muted greys and browns of the sand and stones. 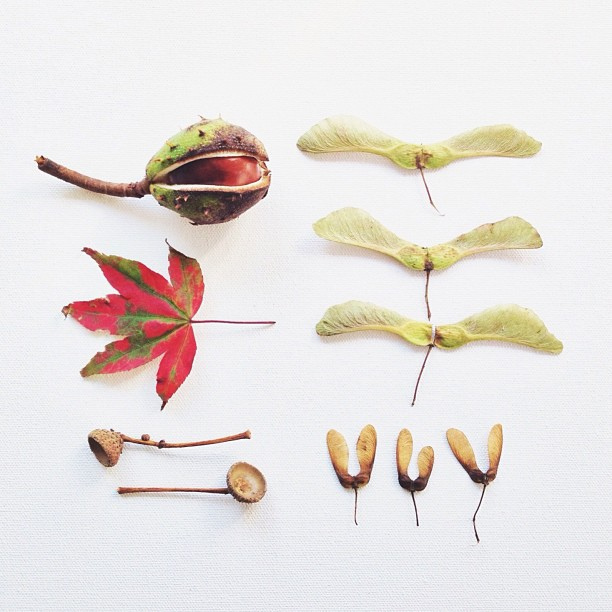 In the Autumn our collections turn to treasures picked up at parks and the woods. We gather conkers, acorns and brightly coloured leaves in warm hues - our collections now a mixture of rich reds, golden yellows, and earthy browns. By the feeling of the weather here this week, I don't think it will be long before we're picking up Autumnal finds. We've already found a few conkers and pretty seed pods. Oh Summer, how did you disappear so soon! 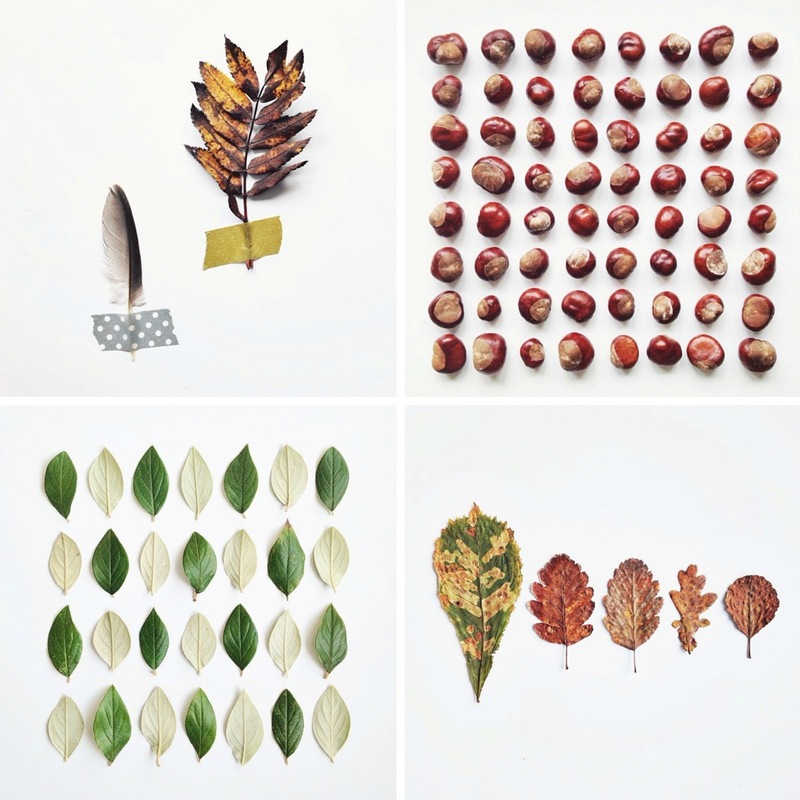 such beautiful collections, you arrange & photograph them so beautifully. I'll pop over to the other colour collaborators. This is a really cool idea! I love collecting things from the beach, unfortunately the beach here says it's 'prohibited' although people still do it! Gorgeous, gorgeous post! And as ever your images are stunning. I am envious of your sea glass collection ... it's not something you find on the sandy beaches of North Wales. Thank you so much for taking part this month Caroline. What an absolutely perfect topic for you Caroline! I always enjoy your collections. I really love your collections, Caroline. They're beautiful and the colors are so vibrant. I like sea glass too, though I don't get to the beach often. I particularly like the photo where you placed the different colored bits all in a row, it's very pretty. I have similar collections scattered all over the house. But the way that you arrange and photograph them is beautiful and inspiring. Perhaps I''l have a go at displaying them for a future post of my own! 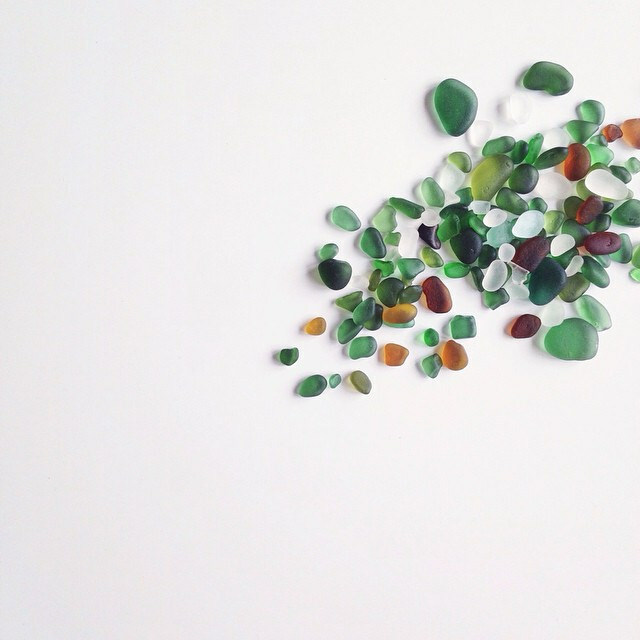 Stunning photos - and I love the sea glass. Daughter and I started our collection just yesterday! amazing as always! i wish i had easier access to a beach. 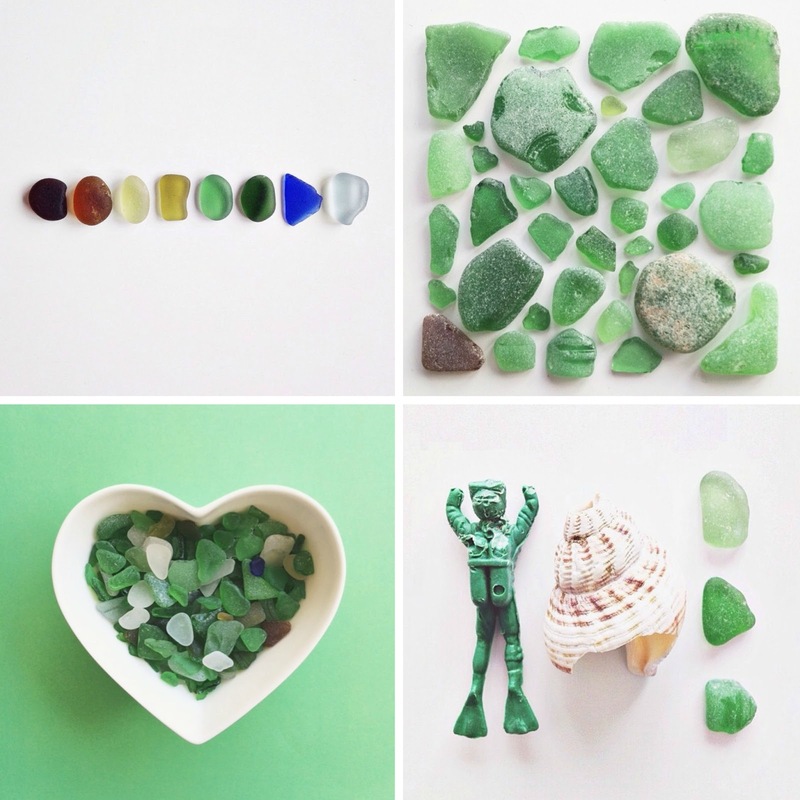 i used to love collecting sea glass and the occasional pieces of porcelain plates(!?). i used to have a green piece of glass when i was little, i took it everywhere with me because i was convinced it was an emerald. i lost it one day and i cried for hours! The main vehicle part, which has the appeal and in view of which your looks lavish is the Car Remote Starter. This is the part in light of which you can deal with your auto at the certain separation.